Today, we have a Valve Steam Controller review for you, a few years after its initial release. We’ll see how it holds up today, what game support looks like, what’s the Steam Controller battery life and whether or not it’s worth your money. But let’s learn a bit more about its history. Valve’s attempt to bring desktop gaming into the living room has been a war they’ve waged for many years now. Starting with their Big Picture Mode which was introduced in late 2012, they’ve slowly begun adapting the PC infrastructure into one that resembles consoles. Following Big Picture Mode was Steam OS, a Linux Distro tailored to the Steam environment. While ultimately a “flop,” it successfully demonstrated the need for games to be ported over to Linux. Whether coincidental or not, since the release of Steam OS, many titles have seen Linux ports or launch support. In addition to Big Picture Mode and Steam OS, Valve also introduced Steam Machines and the Controller + Link. Steam Machines were another relative failure, seeing relatively low adoption rates among consumers. Fortunately for Valve, however, they seemed to have found their footing with the Controller + Link. Now on to the Valve Steam Controller review. Let’s start the Valve Steam Controller review with packaging. While it may not be the most luxurious of unboxing experiences, I was still rather impressed with the amount of “premium feel” Valve was able to squeeze into their packaging. It may still be cardboard, but I was impressed with the design of the box and the presentation of the contents inside. Speaking of contents, everything you’ll need to get started can be found inside. The controller comes with two AA batteries, as well as a Micro-USB to USB cable if you’d prefer a wired experience. There’s also an extender for the wireless dongle if you prefer to use the controller that way, as most people gaming from their couches will. One aspect of the unboxing experience I particularly enjoyed was that as you open the box, the controller itself sits atop all of the additional contents, bringing it to front and center. While this is rather insignificant, I felt it added a nice touch. Additionally, inside of the box were very few manuals and other warranty sleeves, cutting down on unnecessary paper. I appreciate this, because paper waste is becoming more and more of an issue nowadays, and more needs to be done to alleviate this. Overall, the packaging and unboxing experience of the Valve Steam Controller was excellent. At its retail price of “$50” it outweighs its competition in this regard, and getting it on sale makes you feel like you’ve struck gold. Now we’re onto the meat & potatoes of the Steam Controller review: the controller. We’ll be covering every aspect of the controller individually, highlighting all of its big pluses, as well as its major flaws. There is certainly a lot of good to be said about this controller, but that isn’t without its downsides as well, and we’ll be sure to let you know exactly what those are and if they’ll affect you. What’s the steam controller battery life like? If you’re going to use the controller wirelessly, then you’ll want to know about the Steam Controller battery life and how often you’ll have to replace the batteries. This is, of course, assuming you don’t purchase rechargeable ones, however even in that case the Steam Controller battery life will affect you. The Steam Controller reviewer happy to report that the Valve Steam Controller battery life which Valve claims — up to 80 hours Steam Controller battery life — is a legitimate claim. Since getting my hands on the controller a few weeks ago, I’ve put roughly 60 hours into these batteries, and the controller hasn’t yet slowed down on me. This is while using the rumble feature, gyro feature and playing for long periods of time. Color me impressed! Valve truly did not disappoint with the Steam Controller battery life. The Steam Controller takes design cues from a few other, popular controllers… and then throws them out of the window. For better or worse, the buttons on the Steam Controller are rather unique in their design. Starting with the paddles on the rear of the controller, we see a design element which reflects the Xbox One Elite controller, and very few other gamepads. It’s certainly a nice feature, even if its implementation leaves a bit to be desired. The paddles consist of two grip buttons which are actuated by pressing down on the plastic plate on the rear of the controller which doubles as a battery cover. The implementation, while not perfect, does function rather well. There is a very distinct and clear separation between the left and right paddles, and both can be pressed at the same time, meaning the entire plate doesn’t shift to one side, as was one of my original concerns. The buttons have a nice, satisfying click to them, but actuation still feels a little bit mushy. Not horribly so, but enough to endow doubt in anybody who relies on this during intense sequences of games. Overall, however, I’d say they’re an excellent addition to the controller and do not feel like an afterthought. The Valve Steam Controller reviewer regrets to report that the face buttons (A, B, X, and Y) on the Valve Controller feel like an afterthought, and are ultimate… a mistake. They feel as though their presence is to simply mimic the Xbox 360 / One gamepads, but they fall heavily short in this regard. Their positioning is awkward and uncomfortable to use, the buttons are shrunk down to about half the size of the buttons on the aforementioned gamepads, and they’re somewhat mushy and do not feel satisfying to press. However, they do function, for better or worse, for any game you may need them for. Just… don’t rely on them. The Start / Select buttons are an interesting case. You’re rarely going to use them, but when you do, you hope for a decent experience. In this regard, they fair well enough and I’d consider them passable. They feel linear in design, almost to the point of second-guessing myself when I press them, and I’m not sure I like this design choice. What I mean by that, is that unlike traditional buttons which go down with a click, these buttons simply slide down and create a contact with the PCB, registering a press. There is no audible noise while pressing them, and they’re rather easy to push down. However, I struggle to truly complain about them, as they do exactly what they’re supposed to do, and I never find myself not pausing a game when I attempt to. The Steam button is more or less a carbon copy of other “home” buttons on competing gamepads. It can be used to open up Steam and to jump into Big Picture Mode. While in BPM, the button will help navigate you back to your home screen. Overall, a rather nice addition. The shoulder buttons — or bumpers, on Xbox controllers (and L1 / R1 on PlayStation controllers) are, for me, one of the highlights of this controller. They’re sized well, fitting most fingers big or small, and their tactile click upon press is absolutely excellent. They’re rather large, and they protrude past the top of the controller, allowing for easier and quicker presses. Additionally, due to their size, they wrap around the controller a bit, meaning they consume not only a portion of the top but also the corners of the controller. Of the things Valve got right on this controller, these shoulder buttons go near the top of that list, if not the top. Not all is wonderful near the top of the controller, however, and the triggers are evidence of that. While not the worst, and anybody used to PlayStation’s DualShock-style triggers will quickly find themselves at home, compared to the Xbox Controller triggers, these feel much cheaper and much less thought out. The travel distance is rather short, the triggers feel very mushy, and then click at maximum press — which can be bound as its own buttons — makes me feel like Valve tried to take two different approaches at once with the triggers, and failed with both. The travel distance is so short, it almost would have been better for Valve to have opted for non-analog triggers instead. At least the click feels nice, for what it’s worth. If you’re planning to emulate pedals in a car during a Racing Simulator, or need granular control of your triggers, do not rely heavily on the triggers provided on the Steam Controller, or you’ll be disappointed. If you need triggers though, they will suffice over opting for WASD. The single analog stick on the Valve Steam Controller feels lonely, and I think Valve should have given it a twin. The reason for the single stick, we’ll cover later, but for now, let’s take a look at what we ended up with. Anybody coming from a DualShock controller will feel right at home with this analog stick. However, the same cannot be said for the Xbox camp. The analog stick is positioning where the Xbox’s D-pad would go, making it difficult to use for anyone whose muscle memory instinctively goes for the normal position, which is now consumed by one of the Steam Controller’s two touchpads. The analog stick itself is rather nice and enjoyable to use. The rubber dome has a nice, grippy texture to it, and the sides help prevent your thumb from slipping off. The actual travel of the stick leaves me wanting a bit more, but not enough to complain. Furthermore, the actual click of the stick feels excellent. It takes some force to click, but not enough that you accidentally move the stick before clicking it down, as I sometimes struggled to do on my old Xbox 360 gamepad. Aside from wanting another stick for the right side, the single one we got is excellent, and I’m glad to see it on the controller, regardless of whether or not it’s lonely. By far the most controversial design aspect discussed in this Steam Controller review, the touch pads aim to emulate a traditional computer mouse, as well as analog sticks found on its competitors. Whether or not they pulled it off, I have to hand it to Valve: this is a very unique concept. The left touchpad acts as both a traditional D-pad, as well as an analog stick. “How does that even work?” you might ask, and I thought the same thing for quite some time until I got used to it. The left touchpad, while functioning as a D-pad, simply clicks inward to initiate a press, much like you’d expect with any normal D-pad. It isn’t quite as precise as some others that I’ve tried, and I cannot recommend it to Fighting Game enthusiasts, but as a control pad for menu navigation, it works wonderfully. While in touchpad mode, the entire pad acts as a sort of “control stick” similar to the analog stick. Running your finger across the pad will generate some haptic feedback to emulate physical movement, and this works very well. There were times while using the touchpad that I found myself forgetting that there are no moving parts at play here. I struggled to hone in on my precision while using the touchpad in this manner — as a left analog stick replacement — but in due time I was able to manage quite well. It works well but is definitely awkward to learn at first, and you’re likely to struggle for the first week or so. After that, however, I absolutely adore it! The right touchpad, unlike the left one, is only used as a touchpad and does not double as a D-pad or any other type of control. It shares the same haptic feedback as the left touchpad but has a flat design, versus the left touchpad’s D-pad inlay. The left touchpad is angled downward and to the left, and the right touchpad is the same, but to the right. This lends itself nicely to ergonomics, and the touchpads are both very comfortable to use. The right touchpad has a single center click, and it’s somewhat satisfying to use. Especially during Desktop mode, where the touchpads can emulate your cursor and scroll wheel. Due to the positioning of the two touchpads, it can feel somewhat uncomfortable to use both of them at the same time. Your thumbs are holding horizontally from one-another and gripping the controller can be difficult because of this. Another thing I noticed with the right touchpad is that sometimes it feels as if its sensitivity is too low, and other times it feels too high. Lastly, I feel like the right touchpad would have been more comfortable to use if it were placed where the face buttons are, and vise versa. This would somewhat simulate the feel of the Xbox line of gamepads, which I feel struck a perfect balance between ergonomics and functionality. While the touchpads might not be the best control scheme I’ve ever used, after using them for a week in various games of both first and third-person, I found myself settling in rather nicely to the new control concept. It’s unconventional, but that doesn’t mean it’s bad, and it isn’t. The learning curve is very steep, however, so be prepared to reimagine how you play games. The Valve Steam Controller feels surprisingly good in the hands. So much so, it caught me by surprise. The fit feels natural, the controller seems to simply rest against your fingers, and it invites you in to touch it and begin playing. The longer grips that flank each side of the controller are great, and the paddles underneath the controller are a great place to rest your fingers. The paddles themselves take a bit of force to actuate, so it’s fine to rest your fingers on them. 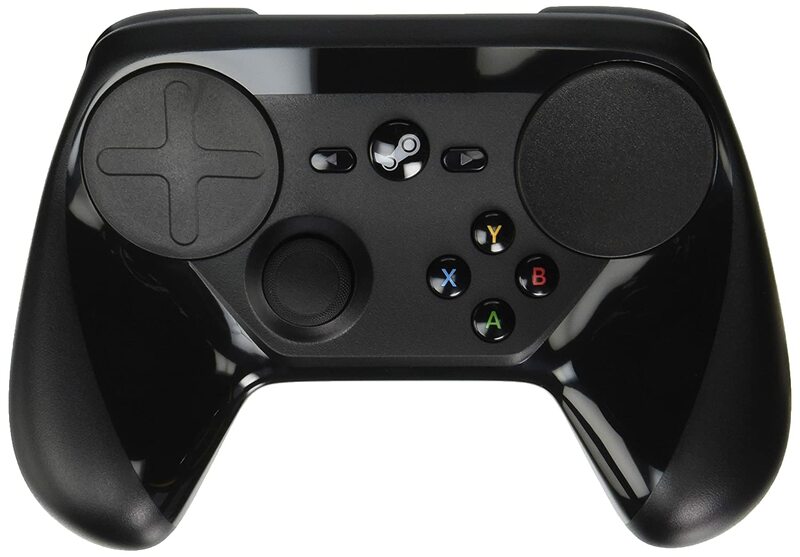 Unlike that of the Xbox One Elite controller (which costs more than twice what the Steam Controller does), the Valve Steam Controller is comprised mostly of plastics and rubber. While this doesn’t break any norms, the plastics on the Steam Controller feel particularly cheap and lend themselves to doubts of whether this controller will last as long as one would hope. The seams where the two halves the body meet were rather sharp — at least on my unit — and left a lot to be desired. While not wholly uncomfortable, after prolonged use the edges did do a number on my hands and I could feel the effects of the plastics against my hands. Furthermore, the controller is comprised partially of matte plastic, and also of shiny, glossy plastic which is a definite finger magnet. The weight of the controller, however, definitely exudes confidence. While not overbearing, the weight of the controller in my hands makes me feel like I’m using a quality product. This was a nice surprise, as from a distance, the controller looks like little more than a hunk of plastic with buttons on it. Overall, the build quality of the Valve Controller, like the seams of the body, is rough around the edges with some major ups and downs along the way. With a little bit of refinement and adjustments during manufacturing, I could see this controller being compared to the Xbox One Elite controller, without the comparison is all that asinine. Lastly, and what a lot of you might have come to this Steam Controller review for, we have controller support. Because of the controller’s unconventional design, and how it’s read as a mouse + keyboard inside of window,s many games will both natively support it, and outright reject it. Confusing, right? Let me explain. There are a plethora of titles on Steam with natively support the controller. What this means is that you can open up the game and expect the controller to work properly. However, for games which don’t support the controller natively, it will emulate your keyboard and mouse instead. To achieve this, individual game profiles are used, and these profiles can be both created by you, as well as the Steam community. The profiles will all individually map buttons to either keystroke or to Xbox / PlayStation gamepad buttons if the game has support for those instead. There is one major disadvantage, and one major advantage to this style of controller functionality. The major disadvantage is that any game you play which does not natively support the controller will need to be configured manually. This can be as easy as setting a profile from either Steam’s recommended list, from the community, or by creating your own. However, once it’s set, you don’t need to worry about changing it, even if you move the controller between machines. Impressive, eh? The major advantage of this is reflected in what I mentioned earlier: creating your own profile. You can create multiple profiles for any and every game you wish — even ones that natively support the controller. These allow you to map any and every button and function of the controller to anything you like. Don’t like the game’s control scheme? Make it whatever you could possibly want! This can go as deep as using the right touchpad to emulate WASD if you’d like, or using the Gyro for menu navigation. I’ve oftentimes found myself lost inside of Steam’s configuration settings for the controller. It’s actually a lot of fun creating my own profiles! I’m happy to report that every game I tried from my library, from indie titles to brand new releases, all have community profiles that make sense. Each community profile displays a rating and total duration used across all Valve controllers, and all of the titles I played had profiles with thousands of hours logged. Finding a profile for your game is a breeze, and I wouldn’t even consider it a hassle anymore. In conclusion of this Valve Steam Controller review, the Valve Controller is an interesting device with an interesting history and future. It’s unique and different, in every good and bad way that might entail. It lends itself to tweakers quite well, while not alienating those looking for a nice controller for couch-based gaming. The packaging is wonderful, the overall presentation is great, and the controller is surprisingly fun to use while offering great functionality, and levels of use that far exceed other gamepads. The Steam Controller battery life is good. Great job, Valve, this was a smart move.